In 2007 Congress named the building housing the U.S. Department of Education for President Lyndon B. Johnson. The legislation was sponsored by Republican Senator Kay Bailey Hutchison and Democratic Congressman Gene Green and signed by Republican President George W. Bush. When a family hits a financial rough patch, they are forced to prioritize by separating the wants from the must-haves. State government is no different. This session, the Texas Legislature will wrestle with how to close a record-breaking $27 billion budget shortfall. In an effort to reduce spending, numerous critical state services will face the chopping block, including education, criminal justice, and health and human services. As the Legislature weighs unprecedented budget cuts, it too must prioritize: What areas of state funding should be reduced before others? What are the moral priorities for the state, and how can they best be pursued given the severe limitations? In a letter sent Tuesday, February 1, 2011, to the chairs of the board of directors and the president/CEOs of approximately 500 chambers of commerce in Texas, I joined Center for Public Policy Priorities Executive Director F. Scott McCown in urging business leaders to help address a challenge facing Texas that imperils our economic recovery and future prosperity—how to cope with a devastating state revenue shortfall. UH Moments have been running weekly on Houston PBS. These vignettes from students, faculty and administrators tell stories of the innovative research, programs and successes that make up the story of the University of Houston. The Hobby Center for Public Policy was recently the focus of the UH Moment. Please click here to watch the video. Join us this weekend at a book fair hosted by Humanities Texas. It will be from 10:00am – 1:00pm at historic Byrne-Reed House on Saturday and they have a great line up of authors for the event. You can find more details at www.humanitiestexas.org. Some Texas elected officials recently suggested that our state should consider dropping out of the federal-state Medicaid partnership. Opting out of Medicaid does not make economic sense or for good public policy. With the state facing an estimated $18 billion to $24 billion budget shortfall, the state should rightfully seek cost-saving measures and revenue generating initiatives. What Texas should not do is shoot itself in the foot by opting out of Medicaid. That would mean losing more than $20 billion in Texas taxpayers’ federal tax dollars every year, so that other states can spend them. Medicaid is the No. 1 source of federal funds in every state budget — Texas is no exception. We have held book signing events and discussions around the state over the last two months. We appreciate those of you who have been able to join us and especially those of you who purchased copies of How Things Really Work. 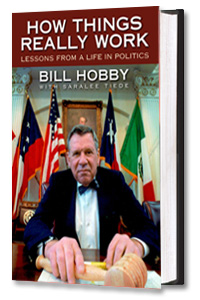 At most events, people have had an opportunity to ask questions about the book and about my tenure in public office. Below are some highlights from these Q&A sessions. Q: You were a successful businessman before entering politics. What made you decide to run? How Things Really Work has been getting positive reviews and we have been busy with events. Please visit the news page to read the latest.